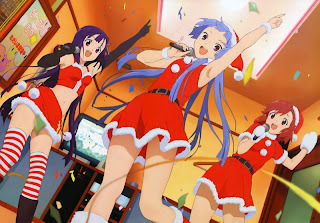 To be entirely honest, I was not the least bit excited about watching Kannagi. It was one of three choices provided to me through the Reverse Thieves' "Anime Secret Santa" project, the other two being Air and True Tears, but seeing as I am generally not a fan of the "moé" subculture of anime fandom, I was not expecting to enjoy this series. And would you look at that! I didn't. The plot, laid out by Hideyuki Kurata (Now and Then, Here and There, Read or Die) follows our mostly cookie-cutter protagonist Jin Mikuriya, who is living alone while his parents are away on a business trip. On the day that he completes his wooden carving of a local goddess, the statue breaks apart, revealing a teenage girl inside! The petulant girl explains that she is Nagi, the goddess that Jin was carving a likeness of. Naturally, she ends up staying with Jin, pretending to be his "long lost sister" to explain it to friends. (Can you count the clichés?) As the story drags on, the cast is filled out with Jin's art club friends (the otaku Akiba and the shy, tall Daitetsu), childhood friend Tsugumi (who has a crush on Jin), and Nagi's goddess sister "Zange-chan" (who  surprise surprise!  also likes Jin). So how about the conflict? What drives these characters to do what they do, and keeps the viewer interested enough to move from episode to episode? Well, nothing! The first few episodes feature Nagi and Jin trying to capture and destroy "impurities," evil spirits (or something like that) in the shape of black insects. What are the impurities and why does Nagi need to destroy them? It's not really explained, but the show sure does make a big deal about these things at the beginning. Later the show focuses on Nagi and Zange trying to outdo each other at being teenage idols. The reason for that conflict is weak as well, with the only explanation being that the two need to gain followers to increase their powers as goddesses. Curiously, though, their "powers" never seem to manifest into anything remotely useful. This arc in particular highlights the show's obsession with the otaku subculture, especially its uncomfortable tendency to pander to its audience at every single turn with teen idols, magical girls, and maid cafés. The middle of Kannagi forgets about BOTH of these conflicts and lapses into pure comedy, with a few episodes about Nagi locking herself in a closet, a karaoke trip, and other silliness. Here the show really shines, as it takes its very simple, one-dimensional cast and uses their comedic strengths  much like 2006's enjoyable The Melancholy of Haruhi Suzumiya  to pull off some surprisingly funny scenes. Finally, it all comes back to a dramatic trio of episodes at the end that seems like a half-hearted attempt to transform the characters of the previous ten episodes into real human beings that the audience should care about. However, when Kannagi's excuse for character introduction is a girl listing off the archetypes that each character fits into, it's only natural that an attempt at real development meets with some massive cognitive dissonance. A few moments in the final episode or two might provoke some real emotion, but mostly you will just want to punch Jin for turning into Shinji Ikari at the last moment. The biggest central conflict that Kannagi has going for it is the romantic relationship developing between Jin and Nagi, but it falls flat in this as well. Unlike Haruhi Suzumiya (also directed by Yutaka Yamamoto), which had a similarly subdued romantic conflict between a deadpan guy and an impatient, immature girl, Kannagi doesn't have a romantic payoff (the kiss scene in Haruhi). Admittedly this is because Kannagi is based on a manga that has not finished, and the show was intended to have a second season, so it is hard to fault the folks at A-1 Pictures for the weakness in the narrative. However, it undoubtedly weakens the first (and only) season as a stand-alone show. With all of this negative talk, you might think that I hated everything about Kannagi, but that is certainly not the case. The animation, for one, is beautiful, and it is clear that animating the character's movements  Nagi's in particular  got a lot of focus from the team. The show might not look as beautiful as Haruhi, which was particularly noticeable for its stellar animation, but it's one of the closest things you can find out there in terms of both animation and art direction. Oddly enough, the background music at the beginning is impressive, using a lot of interesting electronic instrumentation rarely found in anime background music, but later episodes cut back on the use of Satoru Kousaki's fascinating, emotive music in favor of uninspired instrumental versions of the opening and ending themes. 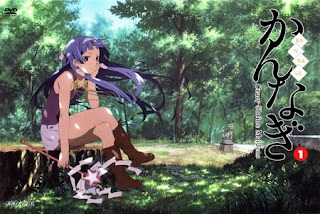 Despite its technical high points, when it comes down to it Kannagi is a waste of time. The show features characters defined only by the archetypes they fit into, but instead of consistently using this potential weakness to the show's comedic benefit, Kurata spends an inordinate amount of time on poorly executed drama and an unsatisfying romantic plot. Still, the most pressing issue that I have with Kannagi is that it simply has nothing to say. At the end of the experience, I was left with only a feeling of, "well yes, that happened." A goddess moved in with a boy, they did some silly stuff that sometimes made me laugh, and they both sort of like each other. Behind all of the big-eyed teenage girls and the half-baked attempts at romantic comedy, Kannagi has no substance, and that is ultimately its greatest failure.